As an accomplished painter and sculptor, Angela Hugghins brings an artist's eye to her work transforming how the world sees her clients' faces. A professional aesthetician since 2000, Angela launched Monarch Brow & Facial in 2016, providing expert skincare treatments, organic facials and lash and eyebrow tinting. After intensive training under Francek Prsa and the pioneering Serbian Master Microblading artist Branko Babic, Angela is one of only a handful of professionals in North Carolina fully certified in PhiBrows microblading. Microblading enhances the eyebrows using semi-permanent makeup to perfect their symmetry, color and thickness based on The Golden Mean, a mathematical formula which Renaissance artists referred to as "The Divine Proportion". It defines the most visually satisfying ratio of length to width, and appears throughout history in fine art, architecture and design. Microblading practitioners are trained in facial morphology to utilize the face's natural contours and coloration to arrive at the most pleasing, perfectly proportioned results. Angela's fine arts training informs her uncanny ability to envision ways to craft your appearance to "The Divine Proportion" based on your specific facial characteristics. View before and after photos under the Media tab on this website. In keeping with the individualized nature of Angela's work, all sessions are one-on-one. No waiting room or receptionist will greet you, just Angela herself. Her studio is an intimate space, designed for private, personal attention. She uses only organic, hypoallergenic and sustainable cleansers and makeup, providing treatments and simple-to-follow guidance to achieve great looking, healthier skin with a minimum of regimen at whatever budget you can manage. The next stage of Angela's quest for perfection is launching her own brand of plant-based, small-batch skin treatment products in the coming months. First up will be a cleansing facial scrub formulated for acne and oily or problematic skin. 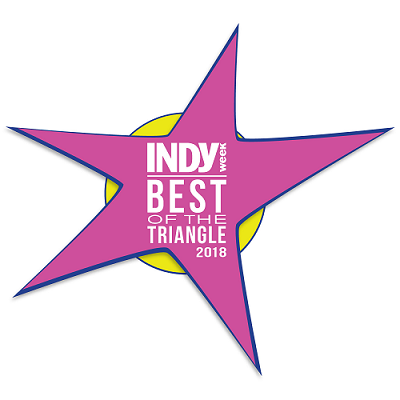 "I have been a client since moving to the Chapel Hill area last year and could not be happier with the waxing and facial services Angela has provided. Angela's professionalism and artistic skill as well as the quality of products she uses makes her the only waxing and facial esthetician I trust with my sensitive skin."